Ever since a new Indian restaurant opened up down the street from us last fall, I can’t get enough. It’s become my new foodie obsession. For me, it wasn’t enough to just enjoy a nice meal out every other month. I wanted to recreate these colorful flavors at home. If you’re new to Indian cooking, don’t let these recipes overwhelm you. Just because the list of ingredients is longer than usual, it doesn’t mean they’re difficult or expensive. It’s true: you may have to spend a little bit on your initial investment in Indian cookery. Garam Masala, Turmeric and other spices are a must, and they can set you back $5-7 per bottle. However, they last a long time and ensure the authentic flavors of India. Plus, most of the other ingredients required are inexpensive and help offset the cost of the spices. This recipe for one of my favorites, Chana Masala, is so flavorful you’ll forget that it’s vegetarian… and frugal! Combine everything except the chickpeas in your slow cooker and turn on low for 6-8 hours. After 6 or 8 hours, add chickpeas and then cook 2 more hours, until they’re tender and have incorporated the Indian flavors. 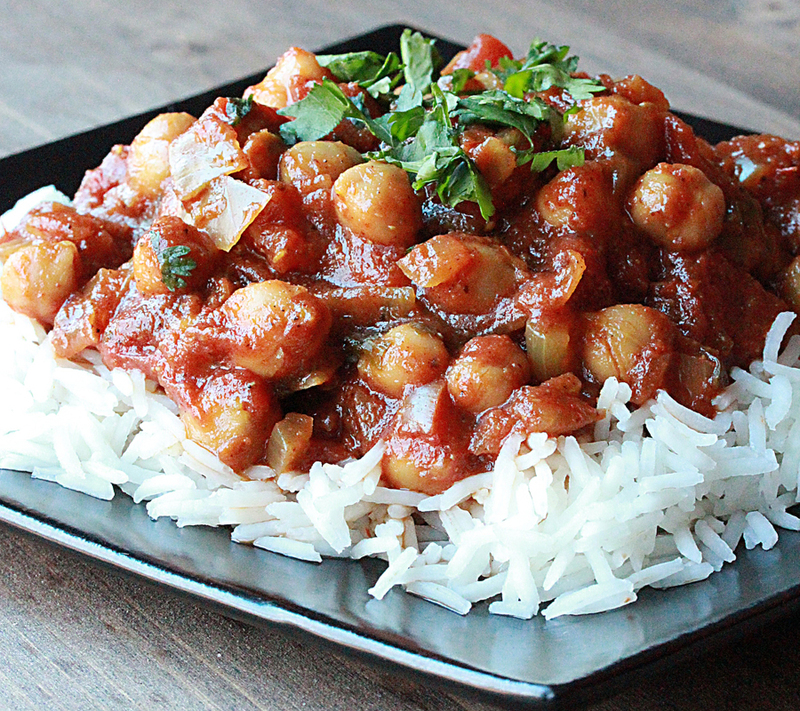 Prepare rice and serve Slow Cooker Chana Masala over Basmati rice. NOTE: If you wanted to use dried chickpeas, you can replace the 2 – 15 oz. can with 1 lb. dried & soaked chickpeas and cook them with the sauce. Add them dried into the slow cooker with the sauce and cook for 6 to 8 hours. About the Author: Kimberly Danger is the creator of Mommysavers.com and author of three books including Instant Bargains: 600+ Ways to Shrink Your Grocery Bills and Eat Well for Less. Her recipes can be found at Frugalbites.com. Could I just buy dried chick peas and let them cook with everything else for the whole time? Currently have this in the crock pot. Doubled a few of the spices and halved the water, also used chicken stock instead of water since it was open and needed to be used. I also added 2 big spoonfuls of sweet spicy mixed fruit chutney I had in fridge too. We’ll see how it is tonight! Mine came out tasting great, but really watery. Almost like tomato soup with chickpeas floating in it! So, 2 questions: do I drain the tomatoes before adding? do I rinse the chickpeas? Maybe something in the chickpea goop is a thickening agent? Yes, all beans need to be soaked, and since chickpeas are one of the longest-cooking beans and overnight soak helps a lot. Soaking then rinsing and using fresh water to cook also reduces gas. I’d also recommend turning on the pot while you are chopping and using boiling water to start. Otherwise your first 3 hours are spent just getting everything up to cooking temp. Alternatively, you could start soaking beans in the morning, throw this together before bed, and eat it for dinner the next day.